Although this was April's body wash, I felt bad scrapping it, and deleting the picture. Georgia Peach & Sweet Tea would give me my tea scent fix. 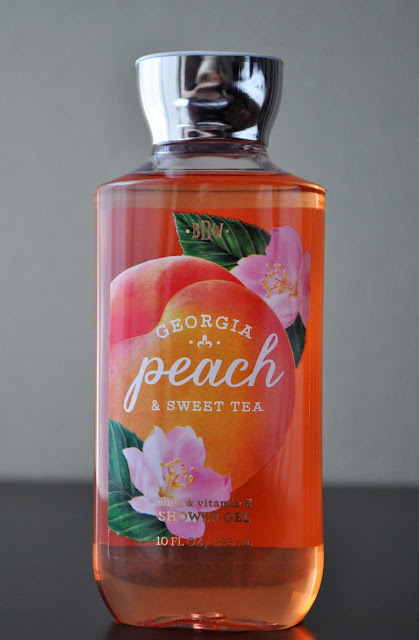 Georgia Peach & Sweet Tea's key notes are: Georgia Peach, Sweet Tea, White Nectarine, Apple Blossom, Jasmine Petal. This peach-colored shower gel is described as, "a stroll through charming tree-lined streets while enjoying a warm breeze on the veranda savoring the delightful spring fragrance fit for a beautiful belle." Georgia Peach & Sweet Tea is more peach than tea. The peach note is definitely the dominate note, with faint swirls of tea, apple and floral scents. Despite being disappointed the sweet tea note wasn't equally matched with the peach, Georgia Peach & Sweet Tea shower gel was a lovely scent for Spring, and I wish it were still available because I want more.